Heavy-duty chassis with strengthening flanges along the top edge for extra torsional rigidity under load. Profiled lifting arm allows low clearance height of just 86mm making this unit suitable for sports and custom cars. Fitted with heavy-duty one-piece hydraulic unit with pump-through action preventing handle locking at maximum ram extension. White saddle aids positioning under vehicle and safety valve prevents overloading. Heavy-duty chassis with strengthening flanges along the top edge for extra torsional rigidity under load. Profiled lifting arm allows low clearance height of just 86mm making this unit suitable for sports and custom cars. 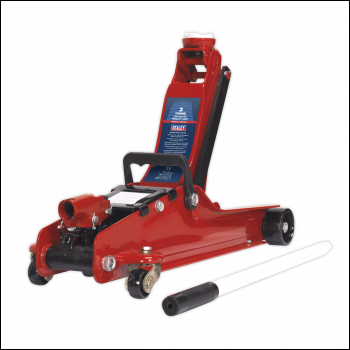 Fitted with heavy-duty one-piece hydraulic unit with pump-through action preventing handle locking at maximum ram extension. White saddle aids positioning under vehicle and safety valve prevents overloading.